​Wing Chun is a style of Kung Fu that originated from Southern China some 300 years ago. ​The system was made famous by a Shaolin Nun - Ng Mui. She realised that many of the Shaolin Kung Fu techniques were ineffective for a small woman against larger and stronger opponents. She therefore developed a system that did not rely on strength or great athleticism for it to be effective. Some say she drew inspiration from observing the movements and characteristics of a snake and crane. Her first student was a female, Yim Wing Chun. 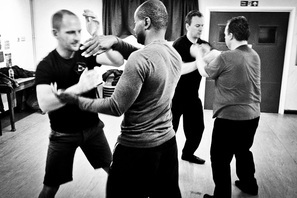 Chi Sau is a two person training exercise synonymous to Wing Chun. It is the platform on which to develop, experiment and experience the practical applications of Wing Chun's concepts and theories. The practitioners contact each other at the forearms and 'roll' through three elemental hand positions: Bong Sau, Tan Sau and Fook Sau. ​"One must capture and control the centreline to occupy a superior position. To occupy the centreline in an instant is the mark of expert skill, by controlling it you have immediately developed a sense of what the opponent can or cannot do. You have, in essence, presented a question or problem for the opponent to answer"
Sensitivity, timing & reflexes - Wing Chun concepts and skill rely on the practitioner's ability to be able to sense the degree and direction of an opponent's incoming force/attack. Sensitivity in the arms refers to the ability to detect and react to even the most subtle directions and angles of an incoming force, also the ability to be able to change (when required) in response to these forces - this allow one to react (without thinking) in the appropriate way. Chi Sau teaches one to flow and not to be stiff as this telegraphs one's intentions - the lighter the contact, the more sensitive the arms will be. The more sensitivity you develop, the faster your reactions will be. To summarise: Chi Sau sharpens the reflexes which eneable you to make the correct response to a particular and ever-changing situation in a split second without hesitation and the need for consideration. Structural Integrity - Your power comes from the ability to root and sink your stance appropriately holding a braced, flexible and mobile position. This underpins all of the above. During Chi Sau it allows the practitioner to absorb the opponent's force by redirecting it through the body into the ground while under constant pressure. One of the primary goals is to disrupt your opponent's balance/centre, while maintaining your own. Forward, springy energy - This is a prying force where you are like a coiled spring that when released moves forward, in this way you do not have to think to react. The force should be subtle and relentless and directed at the opponent's centre at all times. The forward springy energy in one's arms ensures this constant pry as well as the braced, rooted stance as briefly described above. Force against force - Under pressure, students often clash using force against force, this should be avoided as it uses up excess energy and stamina and reduces ones sensitivity which makes one slower to react. Think of opposites (Yin/Yang). If your opponent is using excessive force and feels stiff - try to be softer and yield. If your opponent is soft then apply more force but be ready to change. Not being relaxed - Try to apply techniques in a seamless, smooth manner. If one is relaxed this becomes easier and it contributes to greater speed. Sticking too much - Of course it is important to stick to your opponents arm, this will indicate to you his intentions way before your eyes will pick them up and will determine your response. There are times, however, when you must not stick - this is when your arms are being moved into incorrect or vulnerable positions. If you stick to your opponent in these cases then he is controlling you and you will become open to his attacks, in these cases pull your arms away to occupy the center once more. If you 'chase arms' your opponent dictates your actions. Missing lines/opportunities - This is when lines of attack make themselves available or are created but are not recognized by the practitioner. It's generally due to lack of experience but it can be because of the speed of the exchange ie a line becomes available but is closed down before it is taken advantage of or perhaps because the practitioner has momentarily lost concentration and focus. Performing Chi Sau at a slower and more constructive pace will allow you to spot the lines of attack as they surface then after time, as the pace picks up you will be better equipped to take advantage of those opportunities. Rising out of one's stance - Being sunk in ones stance is an important factor for maintaining good structure. To stay rooted with good structure one must be relaxed with the shoulders sunk, elbows sunk and stance sunk. Over reaching - This is when your opponent is moving away from you and you are continuing to attack but have not moved nearer with your footwork. Your elbows move away from your hips as your arms straighten out which weakens the structure and makes you vulnerable to being pulled off balance. Try to stay 'compact'. Your elbows should always be about a fist and a half distance from your hips, if your opponent moves away don't extend your arms - step in with your feet to close the distance maintaining good structure. Forcing a strike - This is when one attacks without consideration of position or opportunity. The strike will be nullified and energy will be wasted. A good analogy is if you want to open a door, you don't just attempt to smash it in to get into the next room, you just push down on the handle and walk through. ie in Chi Sau don't just attack his arms and try to force the strike through - use your skills to disrupt his balance, or set him up to react in a certain way to the first strike to open the way for a second, and third.